Britain's High Court has ruled that Pringles are not a potato snack, and thus are not subject to value-added tax. This ruling by Justice Nicholas Warren will potentially save millions of dollars for Procter & Gamble, the maker of Pringles. Warren overruled a VAT Tribunal decision that Pringles should be subject to the 17.5-percent tax because it met the definition of "potato crisps, potato sticks, potato puffs and similar products made from the potato, or from potato flour, or from potato starch." 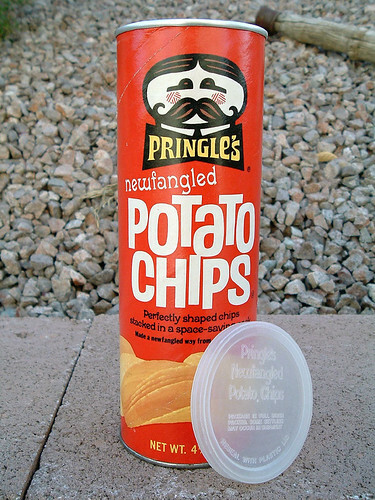 The judge found that Pringles were only 42 percent potato, and thus exempt. This leads me to the obvious question: what's in the other 58%?! Darling Todd, The filler is nothing more than cow lips and chicken sphincters. Right now I feel glad that I don't really eat Pringles. Unless the other 48% is fairy dust and unicorn tears.